Samuel Clarke Pomeroy was a Massachusetts born educator, financial officer for the New England Emigrant Aid Company (NEEAC), mayor, and multi-term senator from Kansas (1861 to 1873). An ardent Free-Soil supporter, Pomeroy moved to Kansas in 1854 to further his work with the NEEAC. He settled in Lawrence and became active in Free-State politics. When former slave state supporters divested from Atchison, he bought up a large share in the city. Pomeroy went on to become mayor of Atchison and invested heavily in bringing railroads through the municipality, including what would become the Atchison, Topeka and Santa Fe Railway. After serving in the U.S. Senate for over a decade, Pomeroy lost reelection after his involvement in a scandal wherein his critics alleged that he paid a Kansas legislator some $7,000 for his vote in the senate race (prior to the 17th Amendment to the U.S. Constitution in 1913, senators were selected by their state legislatures, not through popular vote). Pomeroy spent nearly the first 40 years of his life on the east coast, where he went to college, had a brief career as an educator, and held various political offices. Born in Southampton, Massachusetts, in 1816, Pomeroy attended college at Amherst, Massachusetts, from 1836 to 1838. Following his collegiate career, Pomeroy worked as an educator in New York State for four years before returning to Massachusetts. Once back in the Bay State, Pomeroy held several political offices, including a term as a state representative from 1852 to 1853. 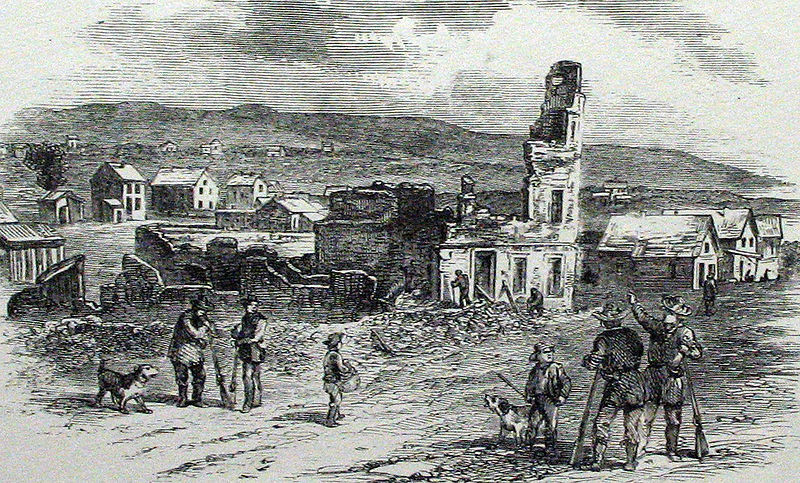 In 1854, Pomeroy started working for the NEEAC and relocated to Kansas, where he became politically and financially involved in the “Bleeding Kansas” dispute. He initially settled in Kansas City, Missouri, where he worked as a financial officer for the NEEAC by helping new migrants’ families find temporary accommodation in Kansas City so that the heads of household could travel into the territory and stake their claim. He also began to invest in townships in Kansas, and in 1855, held a significant stake in recently formed town of Osawatomie. Pomeroy relocated to Lawrence in time to take part in several seminal Free-State events. He was captured while supporting the Free-State side during the so-called “Wakarusa War” of November and December 1855, which nearly resulted in an assault on Lawrence by 2,000 Missourians. He also served as the Chairman for the Lawrence Committee of Public Safety, a position that tested Pomeroy’s leadership skills, restraint, and political savvy. It was in this latter capacity that Pomeroy witnessed proslavery forces under Sheriff Samuel Jones and David Rice Atchison sack Lawrence on May 21, 1856. Kansas Territorial Court Justice Samuel Lecompte incited the sack when he issued an indictment for the arrest of Andrew Reeder, Charles Robinson, and other Free-State leaders for treason. The indictment also declared that several Lawrence structures owned by Free-State forces were public nuisances and should be demolished (the Free-State Hotel particularly concerned proslavery forces, who claimed that the building was more fort than hotel). Pomeroy, in his position as Chair of Public Safety, ordered the Free-State forces not to engage with the proslavery forces, part of a clever and largely successful plan to depict proslavery forces as the aggressors in the media. Atchison, Jones, and the proslavery forces scored a victory in Lawrence but a defeat in the national battle for public opinion. Pomeroy also cultivated business interests in Kansas, most notably in the Atchison area. Proslavery forces had founded Atchison, a town adjacent to the Missouri border, in 1854 as part of a larger effort to encourage slave owners to move en masse into the new territory. The inhabitants named the town after their political ringleader, David Rice Atchison, and published a proslavery paper called The Squatter Sovereign. Sensing that their continued presence in Atchison was not going to alter the territory’s decision on the slave issue, the proslavery forces began to divest their interests in the town, and Free-State supporters like Pomeroy took financial control of the city. By 1858, the city was no longer a hotbed of proslavery ideology. Celebrating the transition, Pomeroy bought out the Squatter Sovereign and symbolically renamed the paper Freedom’s Champion. Pomeroy continued to leave footprints throughout the business and political world of Kansas during the final years before the American Civil War. His business interests in Atchison went far beyond the local paper, expanding to extensive and lucrative investments in the burgeoning Great Plains railroads. Railroad’s ascendency on the national market was clear, and Pomeroy positioned himself (and Atchison) to play a central role by joining the great eastern and western lines. Pomeroy helped found a railroad connecting Atchison to St. Joseph, Missouri, which was the westernmost terminus for east coast railroads in the late 1850s. This line would eventually merge with others to form the Atchison, Topeka, and Santa Fe Railway, a truly dominant force in rail transport. Politically, Pomeroy went on to be a member of the Free-State convention in Lawrence in 1859, served as the mayor of Atchison from 1858 to 1859, and was president of the Relief Committee during the Kansas famine in 1860 and 1861. Although he ended his political career in mild disgrace, Samuel Pomeroy remains an exemplar for all of the noteworthy aspects of Northern migration during the Bleeding Kansas period.An emblematic Northern émigré, Pomeroy found himself elected to represent Kansas as a senator upon the territory’s promotion to statehood in 1861. He had lived in Kansas for less than seven years when he was elected to the Senate, but he went on to serve in the body for more years (12) than he actually lived in the “Sunflower State.” During his years in Washington, he not only served as a senator during the Civil War, but also in the early days of Reconstruction. Notably, he served as campaign chairman for Ohio Senator Solomon P. Chase in his short-lived effort to contest the Republican nomination in 1864. Pomeroy also sponsored Senate Bill 392, which created Yellowstone National Park in 1871. After his aforementioned bribery scandal in 1873, Pomeroy spent the remainder of his life in the Northeast and died in Massachusetts in 1891. Although he ended his political career in mild disgrace, Samuel Pomeroy remains an exemplar for all of the noteworthy aspects of Northern migration during the Bleeding Kansas period. He came to Kansas with the NEEAC, fought for Free-Soil, made a fortune in the railroad industry, and became a senator. When modern Kansans tell the popular, NEEAC dominated story of the birth of the state, they tell a variation of Pomeroy’s story, even if they have never heard his name. Honestly it ios quite interesting and informative stuff which you have shared here. It is sufficient detail about Pomeroy, Samuel Clarke. I like this and would like to share this stuff with my mates too when they will be back from their yellowstone tours from san francisco.